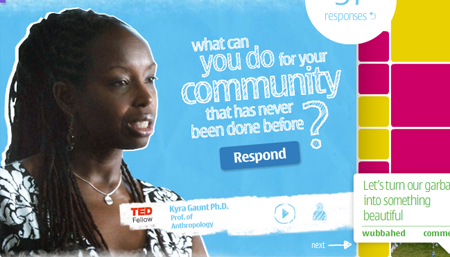 Thought leaders from TED are featured in videos describing programs they’ve developed to help others, using technology. Kyra Gaunt is an anthropologist, lecturer and author. Her campaign aims to improve child education in the third world, by campaigning for one laptop per child, raising money one dollar at a time. Katrin Verclas runs Mobile Active, which promotes the use of mobile phones to promote social change. Tin Ho Chow is a design student who is hoping to spread the idea of responsible design. In his video he explains that he is drawing attention to a lack of affordable housing by cycling across America with the chairty Bike and Build. Responses and videos will continue to be added to the campaign. Kudos to Nokia! They are already connecting people world wide. Its good to see some social activities form their side.